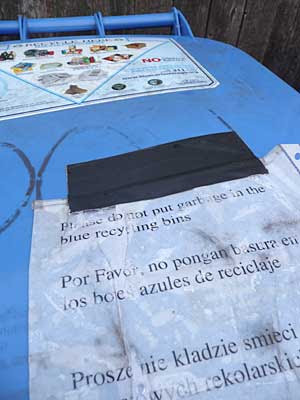 Blue Cart is a single-stream recycling system. Different recyclable materials  paper, cardboard, glass, metal, and some plastics  all can be put in the cart together. This may sound like the notorious Blue Bag program, but it's not. Instead of being co-mingled and contaminated with garbage, Blue Carts are collected with a separate truck and processed at a materials recovery and recycling facility (MRRF, pronounced "merf"). This type of high-tech mechanization has become the standard, and is the most economical way to process what are in reality valuable raw materials. Like many environmentally minded people, I find recycling a very satisfying activity. It changes taking out the trash into a feel-good exercise. But statistics show not everyone feels this way. Most people recycle for economic reasons. If trash collection is expensive, people recycle more. Historically, this has meant that people on both the East and West coasts recycle at much higher rates than people in the Midwest and South. Here in the middle of the country, where there is still plenty of vacant land, rates for dumping garbage are cheap. The company RecycleBank is betting that people are motivated by money. It uses bar codes to track the number of recycled materials. Customers who recycle earn points toward coupons for national stores or brands. RecycleBank is being tested on the South Side of Chicago in the 5th, 9th and 18th wards, including Beverly and Hyde Park. These neighborhoods are already have relatively good recycling rates. Beverly and Hyde Park had voluntary programs for years before recycling became a municipal service. The RecycleBank field test began in August and will continue for six months, at which time the city will decide if it should be expanded. Meanwhile, If you want a small piece of the action, RecycleBank has a new program called “curb-less accounts”. Go to www.recyclebank.com/how-it-works and create an account. You are able to accumulate points for joining the Gconomy (green economy). Even without the incentive of recycling points, recycling makes sense economically. No one can put an accurate price on the real long-term environmental costs of a landfill. It's never a good idea to bury garbage.